Plans to renovate one of the historic Duffy Paper buildings within the North Loop neighborhood into 200 affordable apartments have been cancelled. Dominium has revealed that they are no longer pursuing the project at 528 N Washington Avenue. The reason? Challenges that arose while working with the City of Minneapolis. One of the biggest reasons in particular that the project was cancelled is the fact that the city wanted the apartments to stay classified as affordable for 30 years. Dominium wanted that timespan to only last 20 years. The company cited rising operating costs for running apartment buildings along with rising income levels as reasons for concern when units remain affordable after 20 years. While Dominium had challenges with the city there were also a number of concerns put forth by area residents. One of the greatest concerns was over the lack of retail space in the project that would have made an entire city block of the North Loop strictly residential. This was the third proposal for the redevelopment of the Duffy Paper building since 2016. The site is ripe for redevelopment as it is one of last remaining warehouses to be developed within the North Loop area. But hey, maybe the fourth time’s a charm? Today plan's were announced for a 17 story mixed-use project on what is currently a surface parking lot at 240 Park Avenue. The site has been owned by the Wilf family, also the owner's of the Viking's, since 2007. The Wilf family's company, Garden Communities, will be the developer for the project. BKV Group is responsible for the design of the new building. The L shaped building will include 17 stories broken down into 6 stories of parking and 11 stories of housing with those upper floors will containing 201 market rate apartments. In addition, there will also be 5,000 square feet of retail space on the ground floor fronting Washington Avenue. The exterior of the project will be clad in brick with metal panel accents. The design was influenced by the neighborhood and the materials used on many of the historic buildings surrounding the site. What will be unique is the coloring of 240 Park's brick, it'll stray from the standard red brick which is commonly associated with historic structures and instead will be off-white with accents of grey brick. Garden Communities has developed similar projects across the country. Their projects are often designed with long-term tenants in mind and are known to include larger than average units along with unique amenities such as bowling allies and movie theaters. While exact details about what will be included in 240 Park have yet to be revealed it has been stated that there will be amenity deck on the 6th floor along with another amenity space on the 17th floor. 240 Park will go before the Downtown Minneapolis Neighborhood Association land use committee on Aug. 6 and will be presented to the city later this year. Developers hope to break ground next in Spring 2019 with a completion set for 2021. The Gateway Project has had another design revision, this time removing the hotel and residential components entirely. United Properties has submitted new documents to the City of Minneapolis now showing a entirely commercial project. The revised plans show a 30 story 458’ building with the overall exterior design remaining largely unchanged. Three levels of underground parking would include 500 spaces with an entrance off of S 3rd Street. The first two levels above ground would be devoted to 23,000 sqf of retail/restaurant space, some of that space being devoted to a bank branch for RBC. In addition, the lower two levels would also include 14,000 sqf of conference space, a 5,000 sqf fitness center, along with a lobby for the office space within the upper floors of the project. The office part is where we are seeing a huge change from previous proposals. Now totaling 28 stories in height and 790,000 square feet in space the total office space within the project has nearly doubled. RBC would still occupy 310,000 sqf of office space, remaining the anchor tenant for the building. Other details about the project include skyway access (potentially in two places) and also a public plaza located at the corner of Nicollet Mall and S Washington Avenue. That plaza would be built so that in the future it could accommodate a streetcar line passing through if the city decides to moves forward with the streetcar line. United Properties will be responsible for the development of the overall project while Smallwood, Reynolds, Stewart, Stewart & Associates out of Atlanta, Georgia is responsible for the design. Construction is expected to begin in 2019 with a completion in 2021. The time has come, Minneapolites...the time of self-serve taps. First Draft Taproom + Kitchen is nearly ready to open for business. The unique concept that gives customers "the power to pour their own beer, wine or cider" is opening their first Minnesota location on the ground floor of Variant, a brand new residential building in the North Loop just blocks from Target Field. The opening date? This Saturday, July 14th. First Draft, which bills itself as a unique tasting experience, will be one of the first self pour taprooms to open within the city. You'll find a HUGE variety of craft beer, wine, cider, kombucha, coffee, and cocktails. When we say huge, we're talking nearly 54 taps in total. One great thing is that these taps are always rotating, ensuring every visit is different from the last and that you'll be able to experience brews from Minnesota all the way to the Coasts. One of the best things about First Draft is that you can pour by the ounce, meaning no more wasted beer that you thought you'd like but can't drink more than one sip of. Fun fact? On average customers pour about 4.9 ounces of a beverage. All that beer tasting might make it a wise choice to eat some food, but don't worry, they've got that too. A full kitchen within the space will serve small plates and some larger dishes for sharing. Dishes include everything from cheese plates and deviled eggs, to Mac and Cheese and Caesar Salad. The first thing you might notice when walking into First Draft might not be the taps, but rather a large mural depicting Paul Bunyan and Babe the Blue Ox in front of the Minneapolis skyline. A little nod to Minnesota, eh? Once you've unlocked your eyes from the mural you'll notice that directly in front of you are the 54 self serve taps, all perfectly laid out on the outside of a large cooler the size of a room (we're not kidding). It is pretty centralized, you can't miss it. The ceilings within the space have been left open and long liner lighting has been added. Seating throughout the space comes in a variety of styles from long community tables, to bar seating, to luxurious couches for lounging. In addition, there will also be outdoor patio seating available. Originally from Denver, CO, First Draft Taproom + Kitchen is currently in the process of opening two new location, one in Downtown LA and the other right here in Minneapolis. The company is capitalizing on a new to market trend of self serve taps, something that is sweeping the nation by storm. Locations typically feature 50+ taps and serve beer, wine, cider, coffee, cocktails along with food. For more information, visit First Draft Taproom + Kitchen here. Domimium's proposal for 528 Washington Avenue N.
One of North Loop's last remaining large warehouses may soon see new life as housing. The Duffy Paper building (528 Washington Avenue N) is one of the last remaining undeveloped properties located on Washington Avenue in the North Loop. The massive building once housed Duffy Paper's offices and production facilities, however in 2016 the business ceased operations within the building and since then it has sat largely vacant. Plymouth based Dominium would be responsible for the new redevelopment of the building. 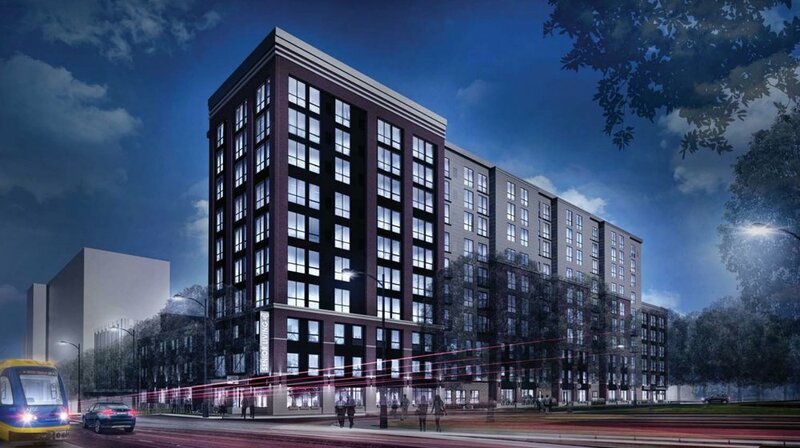 Dubbed "Iron Store", that project would bring 200 affordable housing units to the North Loop. The project is unique in the fact that 100 percent units would be affordable units, something that the North Loop, one of the most expensive areas to live in Minneapolis, is greatly lacking. The large seven story building located at the corner of Washington Avenue and N 6th Avenue would have it's exterior restored and the interior converted into apartments. In addition, Dominium would renovate two additional 1916 warehouses located to the right of the Duffy Paper building into apartments with the grand total for apartments in all three buildings coming in around 140. Dominium also has plans for the vacant parking lot at the corner of the site at the intersection of Washington Avenue and N 5th Avenue. Plans for that site would include a new residential building that would also house affordable apartment units, about 60 in total, along with underground parking. Dominium hopes to begin construction on the project in 2019 with an anticipated completion in 2021. Based out of Plymouth, MN, Dominium "is one of the nation’s largest and most innovative affordable housing development and management companies." They're no stranger to developing housing and affordable housing is one of their specialties. To top it off, they're skilled in restoring and reconfiguring historic buildings. Take for example the A-Mill Artist Lofts, one of Dominium's projects that is within the historic Pillsbury mills located along the Mississippi River. Dominium converted that massive building and a few surrounding buildings from run down warehouses into a thriving artist community of 251 lofts. Best part? 100% of the units are affordable. The total project cost came in around $175,000,000, a huge investment for the neighborhood. Another prime example of Dominium's expertise is the Schmidt Brewery. Completed in 2014, Dominium took that run down site and brought it back to it's former glory, converting the brewery into 247 loft apartments and 13 townhomes. The total investment? $130,000,000. Those are just two local examples of Dominiums commitment to developing affordable housing. We can't wait to see what magic they work on the Duffy Paper building. Minneapolis. We're not screaming with excitement, you're screaming with excitement. Meet Eleven, an ambitious and arguably iconic 39 story residential tower designed by world-renowned architectural firm, Robert A.M. Stern Architects (RAMSA). Planned for a site that is currently a surface parking lot on West River Parkway within the Mill District, the building would be one of the largest and most expensive residential projects to be constructed in Minneapolis post recession. Local Twin Cities developer Luigi Bernardi has partnered with Ryan Companies to develop the project. Designed in an Art Deco style, the 39 story tower would site atop of a low rise podium that would house parking, rentable guest suites and office space. The 101 unit tower itself would feature no more than five residential units per floor with the smallest being 1,600 square feet in size. In addition, the tower residences would only feature two bedroom and larger units, something of a rarity within the Minneapolis condo market. It takes quite a bit of work to design not only a building, but one that can be iconic and more importantly, age well. That's just what RAMSA did. In the last couple of years, Paul Whalen, a lead design architect and partner at RAMSA, spent quite a bit of time in Minneapolis in order to understand the city and it's architecture. In crafting the design for Eleven, he drew inspiration, scale and details from other buildings found within Minneapolis' historic and notable neighborhoods such as the Mill District and North Loop. Paul's responsible for a number of other iconic RAMSA buildings within the world such as 15 Central Park West in NYC and One St. Thomas Street in Toronto. This would be the RAMSA's first project in the Upper Midwest and their third project within the Midwest overall. Their latest project in Chicago is called One Bennett Park. Currently under construction, once completed the 69 story striking residential tower will feature 400 apartments and 100 condominium units. While Eleven is the newest condo project to emerge on the Minneapolis housing scene, it isn't the only one planned around the banks of the Mississippi River. The Legacy, a 374 unit condominium project that reaches 17 stories at its highest point, is in fact under construction as we write directly behind the proposed site for Eleven on the River. That project, which will be complete in Fall 2018, has already sold over a quarter of their units. In addition, there is a 40 story condo tower called "200 Central" that currently is being planned by developer Alatus on the Northeast side of the river. The site has been cleared for the project but a few legal battles from concerned neighbors had postponed the construction start. With those matters being addressed Alatus plans to begin construction later this year. Now, don't let the setbacks of that last project concern you when it comes to Eleven on the River as this project is planned in a completely different area with completely different zoning requirements. Therefore it is very unlikely to hit any major snags in the development process. COULD THIS PROJECT BE A REINCARNATION? Some might say that Eleven is a direct response to another of Ryan Companies previous planned condo projects. The plan, for two art deco towers (not designed by the same firm) ranging in height from 22 to 26 stories, proposed for a site in Edina adjacent to Southdale Center. Ultimately, that project was not approved by the City of Edina due to height concerns (keep in mind there is a 18 story Westin pretty much across the street). At that point Ryan Companies told city officials they would take their plan elsewhere, likely combining those two planned buildings into one single structure. Could this be a new form of the project? Potentially. But let's be honest, if it is a reincarnation of that project then this is Minneapolis' gain and Edina's loss. If it isn't, well, you go Minneapolis' for landing this one. It's about time another world-renowned architect puts their stamp on Minneapolis and we couldn't be more excited for it to be Robert A.M. Stern and his firm. Looking for housing within Prospect Park? We've got news for you in the form of another project being planned for the ever-growing neighborhood. Located at 2813 4th Street SE, 4th Street Lofts will be located on a site that is currently a parking lot on the corner of the Green Line's Prospect Park station. The new 6 story building would include 169 residential units, the majority of which would be studios, along with one and two bedroom units. Now, let's get specific when it comes to those units. This project is unique as so many of the units are studios, typically that style of unit would only be a small portion of the units within the overall project. The developer feels that these units are perfectly suited for the neighborhood as a large amount of its population is college students, many of which are looking for their own place. The 107 micro-units would average about 390 square feet. In addition to those studios there would 36 one bedrooms and 26 two bedrooms located within the building. 40 parking spaces and 144 bike storage spaces would be located on one level of underground parking within the building. An aerial showing other development projects happening within the area (The 4th Street Lofts project is located in the upper left corner). Designed by Minneapolis based architectural firm ESG, the ground floor of the property would include over 7,100 square feet of residential amenities. Among those amenities would be a large lobby, clubroom, and fitness center. Those amenities wouldn't be the only thing located on the ground floor, there'd also be 11 residential units, mostly studios. Floors 2-6 would include additional residential units with a mix studios, 1 bedroom units, and two bedroom units. The sixth floor would include a clubroom with a large outdoor deck and views of the Downtown Minneapolis skyline. With the building being a L shape, the ground floor would also feature a large outdoor lawn area behind the building with lounge space and an outdoor parking area for 23 bikes. The building would be clad in brick on the ground floor with the upper levels of the project being clad in white stucco with accents of wood composite and metal panels. Previously this project received feedback from the City of Minneapolis' Planning Commission on June 28th, 2017, it has since been revised taking that feedback into consideration. It will go before that same committee at their February 20th meeting this month for approval. The Hotel Ivy might soon be getting a new neighbor, one that might take a bit of its spotlight away. Local real estate developer, Alatus, is planning a 31 story mixed-use building at 228 S 12th Street, a site that is directly next door to the Hotel Ivy. Previously the site was home to a church built in the 1950's that has sat vacant since 2006. Alatus would demolish that structure along with the adjacent parking lot, both of which have already been approved by the Heritage Preservation Commission. The close proximity to Downtown businesses, such as the Target Headquarters, make this site an excellent location for residential units. The project would include 360 residential units (most likely apartments) that would be found within floors 3-29 along with 8,769 sqf of retail and restaurant space on the ground floor, and 4,800 sqf of office space on the second floor. The ground floor would include a large auto-court, bike storage, residential lobby and offices, and two retail spaces. 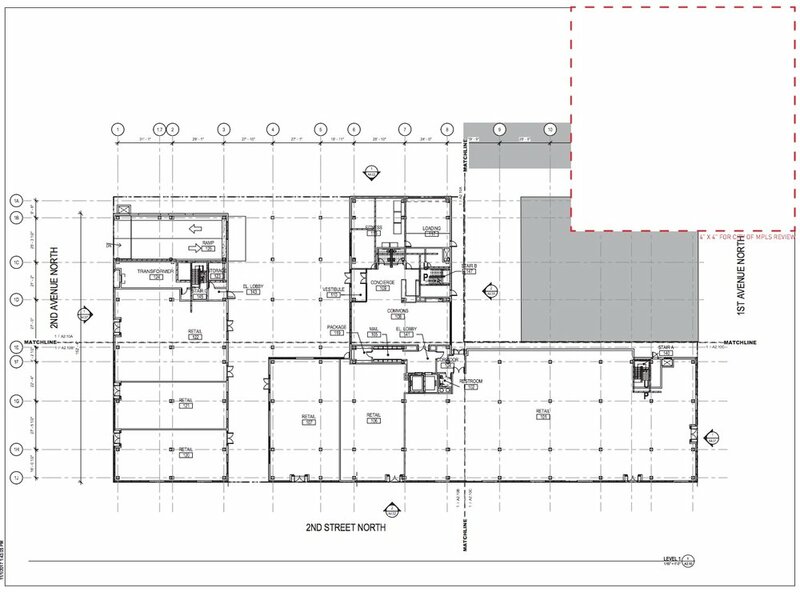 On the first floor at the corner of 2nd Avenue S and 12th Street S would be a 5,031 sqf retail space. 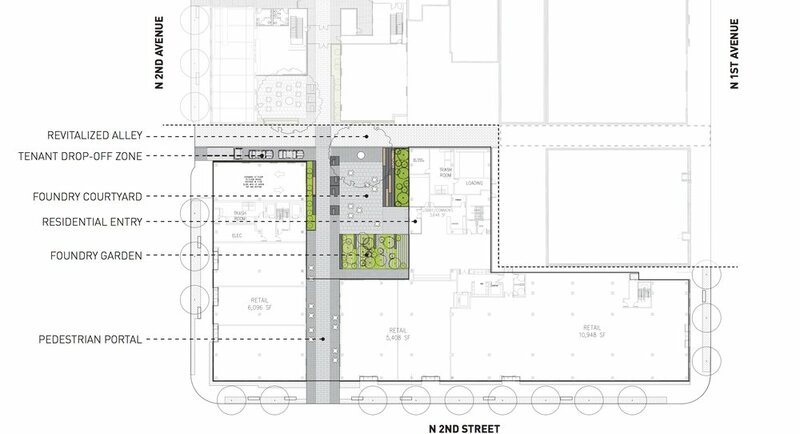 On the opposite corner at 3rd Avenue S and 12th Street S there would be another commercial space of 3,738 sqf of space. Both are perfect sites for a restaurant, something that the area is currently lacking and something that attendees to the convention center (which is across the street) often complain about. The 380 residential units within the building would be a mix of studio/alcove units, 1-bedroom units, 1-bedroom plus den units, 2-bedroom units, 2-bedroom plus den units, and 3-bedroom+ units. Developers hope to provide accommodations for all types of lifestyles. Floors 26-29 will hold larger penthouse units, the details of those exact units have yet to be revealed. 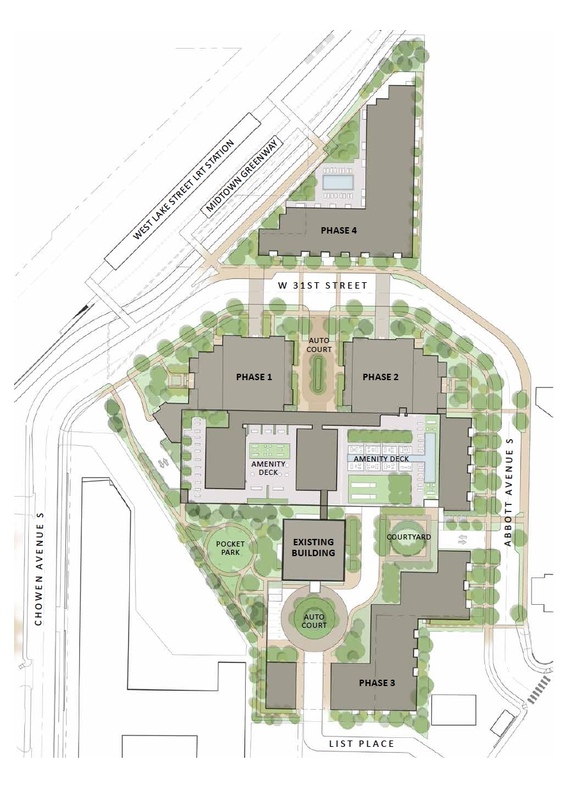 Amenities for residents will include "a pet spa, a hotel-like lobby/leasing center and Wi-Fi coffee lounge, fitness center, yoga studio, club room and resort-style courtyard" according to the documents filed with the city. The building will offer its residents on-site management, indoor parking, and private storage lockers. The seventh floor will also feature an outdoor deck that will have a number of amenities for residents and perfect views of the downtown skyline. An ample amount of parking will be included within the project for both residents and public use. 580 stalls, all enclosed within the building, will be located on one underground and six above levels. Constructed with post-tensioned concrete, the building will feature a modern and contemporary design. Standing 407 feet tall at the roof line, one unique element will stand out; a back-lit frosted glass panel and decorative light feature at the top along with a LED color changing spire that would reach from the ground floor all the way to 108 feet above the roofline. The final building height would clock in at 515 feet tall. To put that in context, the neighboring Hotel Ivy is 26 stories and stands 301 feet tall. The design of the facade of the building would include expansive windows that would allow ample natural daylight into the residential units. The exterior would be clad in pre-cast concrete, metal panels, and high-pressure laminated panels and glass. Outdoor recessed balconies will be found within many of the residential units layouts. One element that we love about the construction of the building is that the fact that a long portion of the ground facade is recessed back from the first two floors, allowing the upper floors of the building, beginning at the third level, to jut out. The exposed columns within this area will be covered with a polished black granite. A number of ground floor improvements will be made to the streetscape such as extensive landscaping along with an artistic sculpture within an outdoor plaza at the corner of 3rd Avenue S and 12th Street S.
We're keeping our fingers crossed that this one sails through as we think it's a phenomenal project. Way to go on the design, ESG! This project will head to the Minneapolis Planning Commission's Committee of the Whole at their February 8th meeting. Food Halls are all the rage right now... North Loop is all the rage right now. Sounds like a perfect match? One company thinks so. A long vacant site at the corner of 5th Avenue N and 4th Street N (next to Modist Brewing) could soon be home to a 17,236 sqf two story commercial building that would be the home of Graze | Provisions & Libations. Now, the text within the planning document is so good at describing this place that we are not even going to take our chances in re-describing it to you. Just take a moment to read the text below on what Graze is meant to. The entire space will be vibrant and tell a story within and outside of its four walls. Casual, dining, alive --- all words that describe the venue itself. Walk in, and grab a cup of coffee. Get some work done in the café/lounge area. Grab a bite to eat at lunch or after work in the communal dining areas. Head upstairs for the ambiance and beverages. Head outside to the green space on warmer days --- play and escape. All of this in one space with prominent music and artistic influences throughout the design of the space ... a food & beverage venue local Minnesotans will be proud to call theirs. Gave you goose bumps, right? The two story food hall would include "several, local chef-driven concepts" showcasing cuisine from some of the best chefs in Minnesota. Each level would have a full bar, the ground floor bar would even be accessible from the outside during the warmer months. That means you'll never have to leave the outdoor patio in order to get a drink. On the ground floor there would be four kitchens, a cafe serving coffee and pastries (which would be accessible from both the interior and exterior via a window), a full bar, and restrooms. The second floor would include two additional kitchens, another full bar, restrooms, storage, and offices. From within the building visitors will be able to dine within any of the indoor areas that features seating arrangements from intimate to communal. If you'd like to dine outside, a ground floor patio located to the left of the building next to an outdoor plaza that serves the adjacent Bookman Stacks residential building will be available. On the second floor of the building there will be a large, and we mean large is it totals over 3,000 sqf , patio with seating and beautiful views of the downtown skyline. In addition to the patios, the ground floor will feature a large outdoor plaza with ample outdoor dining space, seating areas, and even a landscaped area that will be set up in an amphitheater style. Designed by ESG, the structure of the building would be created using two levels of steel-framing and be clad in brick, wood, cement board, metal panels, and glass. Now before you begin the chant that something more dense, something taller, and something more residential should go in this space, let's keep in mind a few things. The current design for the building is 30' tall and there's a good reason for that. There's actually a 40' height restriction for this plot of land making a third level nearly impossible. There's also quite a bit going on underneath the site at the moment making an underground garage, which would be necessary for anything residential, nearly impossible. This project will be presented to the Minneapolis Planning Commission's Committee of the Whole at their February 8th meeting. We'll have more information for you after that! Ladies and gentlemen, it's moving forward. Located at 1455 W Lake Street near the corner of Lake Street and Hennepin Avenue, the project would see the demolition of the current four story Sons of Norway office building, a large surface parking lot, 6 residential lots, and an alley way and the construction of two much larger buildings. While the project is technically four footprints at its base, it really is only made up of two buildings as those lower masses are connected above. The mixed-use building would be seven stories tall while the residential building would be five. Together the two buildings would include 319 residential units along with 23,000 square feet of commercial space. Now, don't image just one huge building because that's not what the developer is planning. The project is meant to look as if it is composed of multiple buildings (technically it is) which helps break up the overall mass. In order to break up this large project, the buildings will be split into two separate masses that will be connected by a five story glass walkway. 23,000 square feet of commercial space will be spread throughout the project. The rounded facade on the corner of Lake Street and Humboldt Avenue S will include 16,000 square feet of new office space for the Sons of Norway. An additional 7,000 square feet of ground floor commercial space will be available for retail and restaurant use on the W Lake Street side of the building. One five story residential building will begin on the corner W Lake Street and will stretch down the full block of Holmes Avenue S and turn the corner at 31st Street S for about half a block. The other residential portions will flank the curved tower at the corner of Humboldt and Lake and be seven stories tall. All together there will be 319 residential units, with some of those on the Holmes side being ground floor walk up units. Parking won't be an issue for any residents, workers, or visitors to the project as there will be one level of underground parking that spans the entire project site and includes 323 spaces. What is probably one of the most unique factors of the project is that the fact that it includes SO much public amenity space, something that isn't very common with redevelopment projects these days. Accessible via W Lake Street, area residents can visit a pocket park located between the two buildings. In that space there will be a public plaza that features winding walkways, ample seating, a fire pit and water feature, and a even public skating rank during the winter months. Sounds like a great place to rest your feet after a day of shopping in Uptown. After a few minor changes requested by the City are made developers hope to begin construction on the project this Spring with completion expected in late 2019. In the design world, things are always better in threes. Bader Development made plans public this week for two 22 story residential towers that would be located next to their current 22 story residential tower, Calhoun Towers. In addition, two 6 story residential buildings would be constructed in future phases. The grand total of new residential units proposed? 739. Yeah, that's a lot of housing. The project is proposed at 3430 List Place, a site that currently is home to a surface parking lot behind a large retail development that includes Whole Foods off of Excelsior Blvd in the West Calhoun neighborhood. The original residential building, Calhoun Towers, is a 21 story building that was constructed in 1962 and is currently home to 113 residential units. The proposed plan would be developed in four different phases with the first phase being a 22 story residential tower would be home to 242 residential units. The second phase would be a mirrored version of the first building and be home to 258 residential units. During the third phase a 6 story building would be constructed on the northern end of the site and would include 124 units. The final phase of the project would be located on the southern end of the site and would include a 6 story residential building with 115 units. And there you've got it, 739 new residential units. With the building of Phase 1 and Phase 2, two amenity decks would be created on the ground floor of the project. Adjacent to the original Calhoun Towers a pocket park, courtyard, and auto court would be modified/created with phase 3 surrounding this area . The final phase of the project would include an outdoor pool. Now, these are just the amenities that are on the site plan, what's including within the buildings has yet to be made public. But, if this is what's on the outside... we can only imagine what's on the inside. This project went before the City of Minneapolis' Planning Commission Committee of the Whole last Thursday. We'll be sure to provide an update on the decision and recommendations of the committee right here on our website when they are made public. Work has begun on a new mixed-use project, part of a larger mixed-use project, in Minneapolis' North Loop neighborhood that will eventually bring 40,000 square feet of new retail space to the neighborhood. Located at 128 Second Street N, the site of what was recently a block wide parking lot, the new six story building will consist of not only retail space, but also apartments on the upper floors. If you like to shop or eat, this place will most likely have you covered in the future. On the ground floor of the building there will be five retail spaces totaling 22,670 sqf of space which is a little more than the amount of retail space found in the neighboring 222 Hennepin mixed-use project (which is home to Whole Foods). One of the ground floor retail spaces is shown as a rather large space anchoring the corner of Second Street N and First Avenue N. Could that space be the future home of West Elm? While West Elm will be constructing a hotel down the block, the company specifically stated that the store would not be located within the hotel, but rather within close proximity to the hotel. Now, we're not one to start rumors, however the amount of space included in that one retail space looks, along with it's neighboring retail space, to be around 12,000-15,000 square feet. News broke last year that West Elm is planning a location in the North Loop and if our research proves to be correct, the average West Elm location looks to be about 13,300 square feet... making this space a perfect candidate. The overall design of the building, which was created by Snow Kreilich Architects, features a few unique things. The first is a a central courtyard that serves as a unique entry point for the two underground parking levels that will hold 182 parking spaces. It will eventually tie into the courtyard of the other commercial project being built on this block. The courtyard will add another active use on the ground floor of the building, something that will be a perfect fit for the North Loop. The exterior of the project will be entirely cladded in a dark grey brick. What will be unique about this cladding is the formations in which the brick will be run over the facade. In addition, the use brick for an entire cladding of a building will make this project fit right in to the history of the North Loop. Another design aspect that is different for this building compared to others recently constructed in the neighborhood is that it will include inset balconies. This means that the entire front of the building will be on one seamless plane without anything architectural details jutting out besides the canopies of the retail spaces found on the ground floor. In addition to the ground floor retail, the project will also be home to 156 apartments on floors two through six including studios, 1 bedroom apartments, 2 bedroom apartments, and a few two story lofts overlooking the shared courtyard. Residential amenities will include multiple outdoor spaces, a fitness center, ground floor lobby, and more. The project is expected to be completed in Fall 2019. The housing supply continues to increase in the North Loop, this time around it's Opus Group that is bringing forward plans for 225 apartments. The project is planned for the corner of Plymouth Avenue N and W River Parkway where currently there is a large plot of land that is owned by the Star Tribune. If Opus' plan gets approved by the City of Minneapolis, that land may soon sprout a 6 story apartment building. 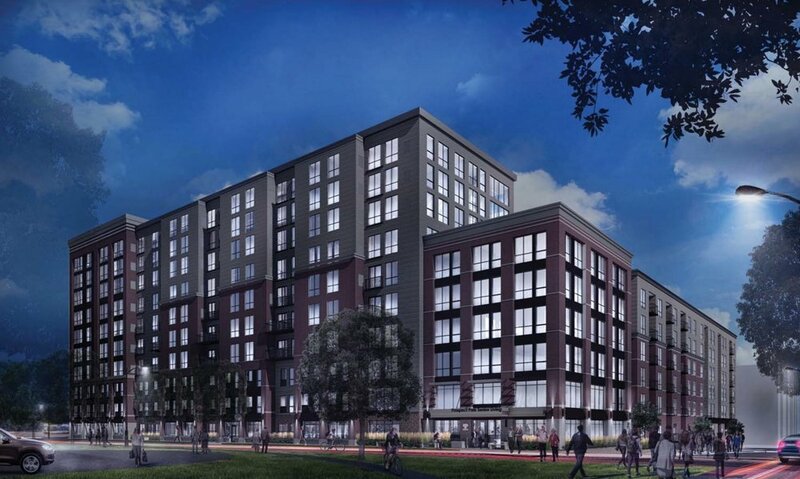 Designed by ESG, the six story residential building would be home to 225 apartment units ranging from 465 to 1139 square feet and would also include 270 enclosed parking stalls on two floors of lower level parking. The overall design of the building would follow an "E" shaped layout with large outdoor terraces on the ground floor, one being a "passive" terrace and the other an "active" terrace. In addition to those two ground floor terraces, the building would also feature an indoor pool, a large fitness center, clubroom, and expansive lobby with work rooms, conference room, and more on the ground floor. On the sixth floor residents would find two private lounge rooms and an outdoor terrace with views of the North Loop, Mississippi River, and Downtown Minneapolis. Every unit within the building would feature an outdoor amenity space of some sort, whether that be walkout terrace found on most of the ground floor and sixth floor units or a balcony for the rest of the units within the building. The front of the building would face the Star Tribune Printing Plant and be located on a private drive. The ground floor of this side of the building would feature a number of walk-up units along with the building's entrance and the entrance to the underground parking garage. If 800 1st Street N is approved by the City of Minneapolis, construction would most likely begin in Spring 2018.